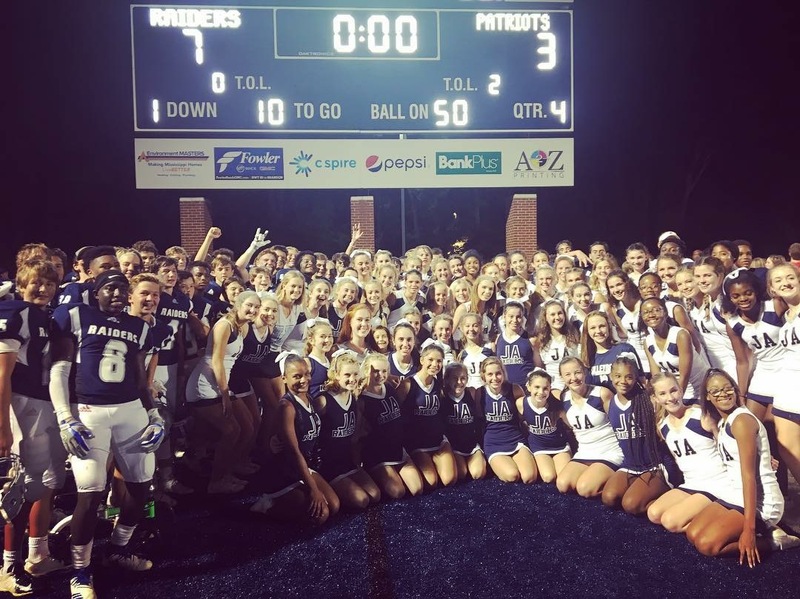 The Junior High Football season came to an end on Thursday night at The Brickyard and it was a very successful night for the Raiders against Jackson Prep. The 7th Grade team got the night started off on the right foot with a dominating 24-8 victory over the Patriots. They improved to 4-2-1 on the season. The 8th Grade Raiders lost earlier in the season to Prep 8-6 but the rematch was a much different story as they jumped out to a 14-0 lead and won by the same margin 20-6 and improved to 3-1. The Junior High Raiders were locked in a defensive battle to the end as they trailed Prep 3-0 late in the 4th quarter. Prep had the ball at the JA 11-yard line but the defense held as the Patriots turned the ball over on downs to JA with just 4:49 remaining in the game. JA then converted a fake punt on 4th down and converted a 4th down and 20 to keep the drive alive. Then on 4th and 4 with 1:26 left in the game and no timeouts remaining, Porter Harrell shifted into the wildcat formation and ran it in from 29 yards out to give JA the lead 7-3 with 1:19 left in the contest. Then Trey Adams sealed the game with an interception and JA would run out the clock to finish the season a perfect 7-0. The make-up game with PCS for the Junior High Raiders was cancelled next Tuesday so their season came to an end with the win over Prep. The 7th and 8th graders will combine to play a 4-quarter game on Tuesday at 5:30pm in Hattiesburg.